If your day to day life is leaving you bored and uninspired then a nature trip is the perfect solution. Seeing wild animals in their natural habitat is something that few people get to experience. Here are five holiday destinations for animal aficionados. Sri Lanka is fast becoming one of the best places in the world for ecotourism. Just ten years ago there was a revolution going on and the country was unsafe to visit. But now there are many options for nature lovers. Whale watching in Mirissa is just one fabulous option. Many species of whale migrate through these waters annually and depending on what time of year you are there you may see Killer Whales, Fin Whales, Bryde’s Whales, Sperm whales, or even catch a glimpse of the largest mammal in the world, the Blue Whale. This is the trip of a lifetime to see these rarely seen creatures in the wild. Malawi has nine national parks or nature reserves for animal lovers to view to their heart’s content. Large predators like lions are rare here but there are plenty of other exciting animals to view in their natural habitat. On a Malawi safari you can expect to see buffalo, zebra, elephants, hyenas, porcupine, monkeys and baboons, bush pig, warthog and many different breeds of antelopes in abundance in the parks. You can also find rare sightings of black rhinoceros, lions, and jackals. Take a trip down the Shire River where you will spot hippopotamus and crocodiles sunning themselves. Just be careful to keep your hands out of the water! South Africa is one of the most famous places in the world to see big game in their natural habitat and the area has been open to ecotourism for decades. You will definitely see the big five here. The big five are the lion, wild buffalo, elephant, leopard, and the rhinoceros. If you want to make a difference to the lives on the animals, you can volunteer with elephants here and give something back. You can take safari rides in 4 wheel drive vehicles, fly over the reserves in small planes, or even go for walking tours during the day. There are several different kinds of accommodations available and you can camp in a tent or stay in a five star villa. 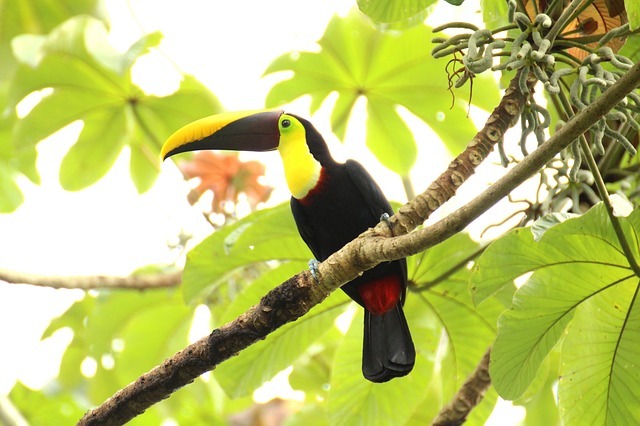 If you are an animal lover and you are visiting Costa Rica then a tour of the Costa Rican Rainforest is something you must try. Take a guided trek through the rainforest and you will see slow moving sloths, monkeys leaping from tree to tree, and many different kinds of birds. There are also many different species of amphibians, reptiles, birds, insects, and arachnids so keep your eyes peeled. Some of the tours offer an overnight stay in the rainforest as well. Polar Bears are considered an “at risk species” and global warming is causing their habitat to melt away. But there are still a few places in the world where you can see these majestic giants in their natural environment. The best way to experience this is to go for a ride on a buggy that was built specifically for this purpose. All four tires are over six feet tall and there is a sturdy cage built over the top of the buggy. This allows you to comfortably and safely ride amongst the bears and not have any worries about your personal safety. You will have an unspoilt view from above the mighty white bears as they forage for food and frolic in the snow.